Garry Kasparov was the youngest ever World Chess Champion. In 2005, he announced his retirement from competitive chess after twenty years as the No 1 ranked player in the World. In the 1984 World Championship in Moscow, Anatoly Karpov met the young man who would offer him the greatest challenge and take away his world title. Throughout the championship, both men demonstrated excellent strategy and intellect. Eventually, after five months, the World Chess Federation cancelled the match, citing exhaustion by both players. The very next year, Kasparov came back to beat Karpov and made history by becoming the youngest World Champion at age 22. Since then, Kasparov has defended his title against Karpov in 1986, 1987, and 1990. Kasparov also defended his title in 1993 against Nigel Short and in 1995, against Viswanathan Anand on the top floor of the World Trade Center, in New York City. Besides winning championships and tournaments, Kasparov took chess to a whole new level by using his own versatility and experience to become a one-man chess ambassador to the world. In 1997, he took IBM’s challenge to match wits against Deep Blue, a customised supercomputer. Throughout this event, he demonstrated the power of the human mind and pitted logical thought against the multiple algorithms of a supercomputer. Education and technology are important to Kasparov. The Deep Blue match heightened public understanding of computers and their capabilities, and also pointed out some of their limitations. Kasparov himself is a computer scientist, and has written chess software programs that enable users to pit their wits against the finest chess mind in a home environment. 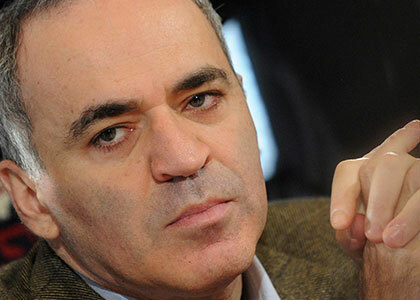 Since his retirement from world chess, Kasparov has become involved in Russian politics. He is busy campaigning throughout the length and breadth of Russia and, as he explains, “We are not fighting to win elections – we are fighting for having elections. The goal is to bring all opposition groups into a broad coalition to return Russia to the path of democracy.” In 2004, he was elected Co-Chairman of the All Russian Civil Congress and in 2006 he became Chairman of the United Civil Front of Russia. Kasparov’s book, Winter is Coming, combines his unique background and insight with insider knowledge and a strategic view of history and current events to examine the threats the free world is facing today.